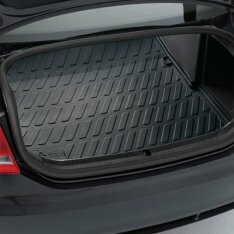 Trunk - Rubber Cargo Mat 2005 - 2011 - Exact-fit boot protection for more cleanliness. The practical boot tray with its surrounding edge protects the floor of your luggage compartment from wet and dirt. It is fully waterproof and the integrated pattern prevents your load from slipping.